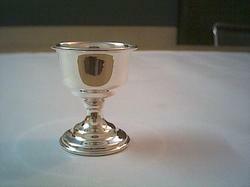 we are manufacturer and exporter of sterling silver egg cups. we make these egg cups in different designs. They are made of 92.5% purity of silver and hallmarked in Britain. These egg cups are a perfect gift for new born babies or young ones at your home. They are a nice gift for all kids on their birthdays or if you are visiting your friends, sister, relatives or any one over dinner. It is a lifetime gift for any kid who would remember it for years. we are manufacturer and exporters of sterling silver gifts and articles from India for the last more than 2 decades. We make these egg cups in different designs and sizes as per buyer's specifications and requirements. This egg cup is beautifully designed to suit every ones requirement of gifting purpose. It is one of the best gifts for your young ones at home, in relation or at friend's house. The child will never forget this gift in his or her life as it is so stunning and finished with perfection by our expert artisans.